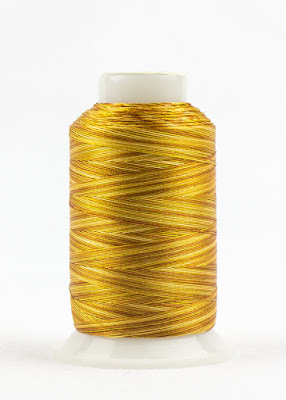 Yardage -- Anything 1 yard or over gets put together in a bucket of yardage. 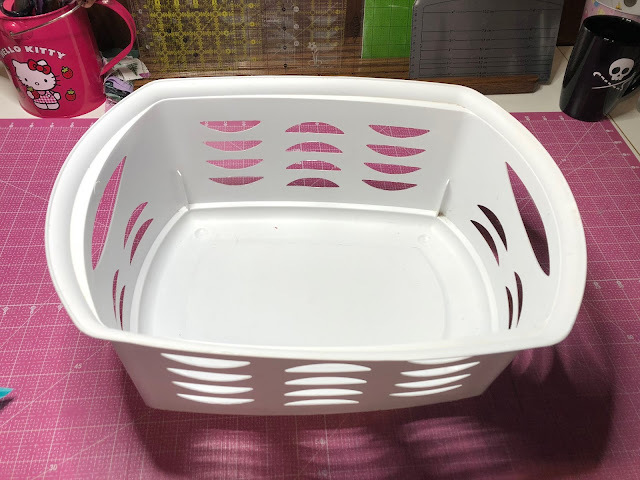 I pull from there when I need larger pieces (background, borders, backing, etc.) for a new project. 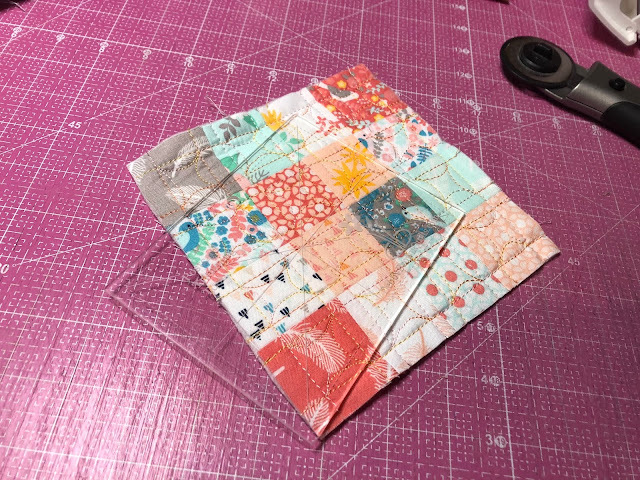 Fat Quarters -- I keep a drawer full of fat quarter cuts, either purchased or leftover from larger projects. 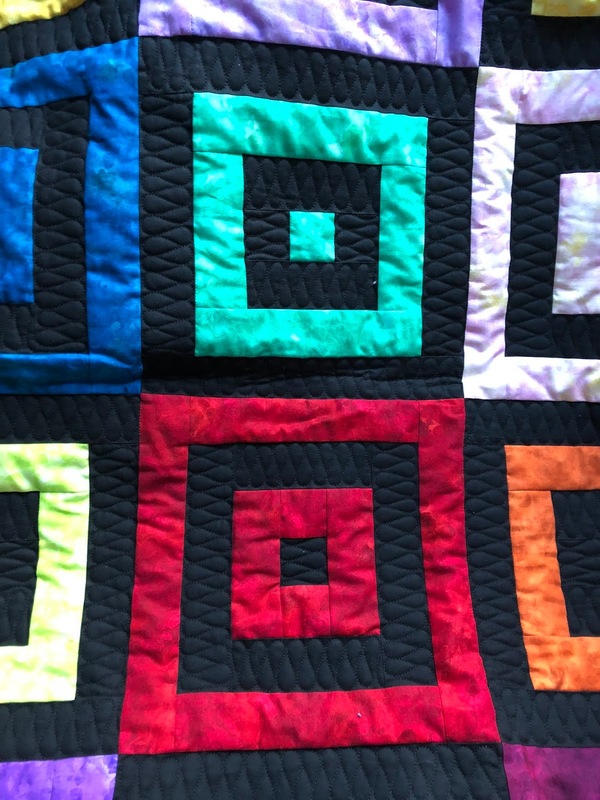 Fat Eighths -- I design Cutie Quilts which use 16 fat eighths (9"x22") for each quilt. 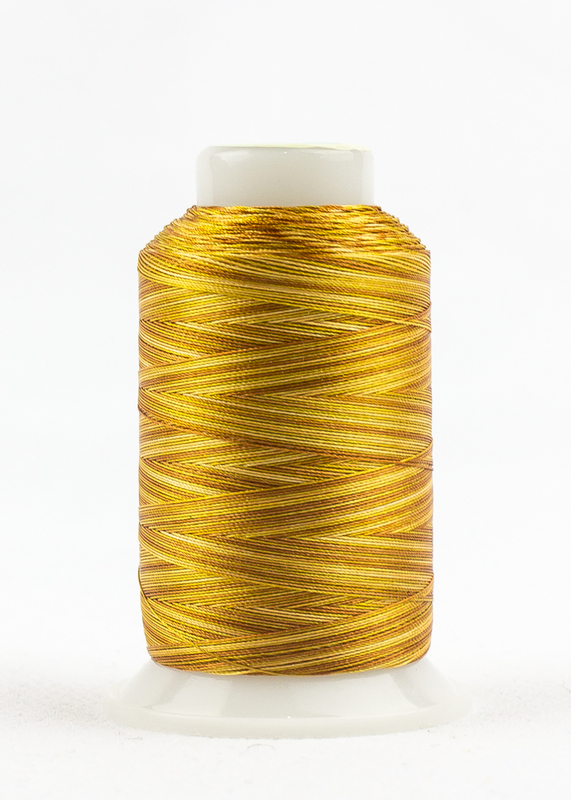 I cut my leftover fabric into fat eighths. 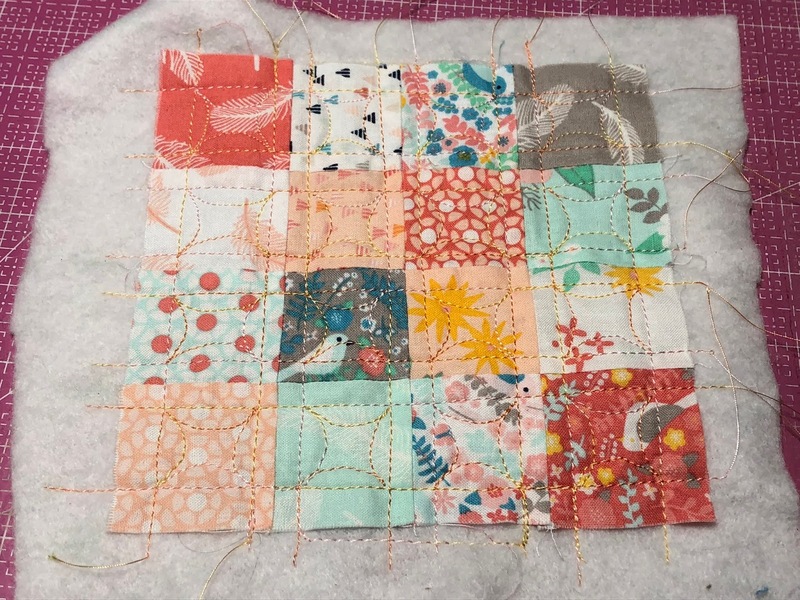 When I'm designing a new quilt and need to test the pattern, I often pull 16 "cuties" from my drawer to make the sample. Sometimes they aren't very pretty, and sometimes they work together beautifully! 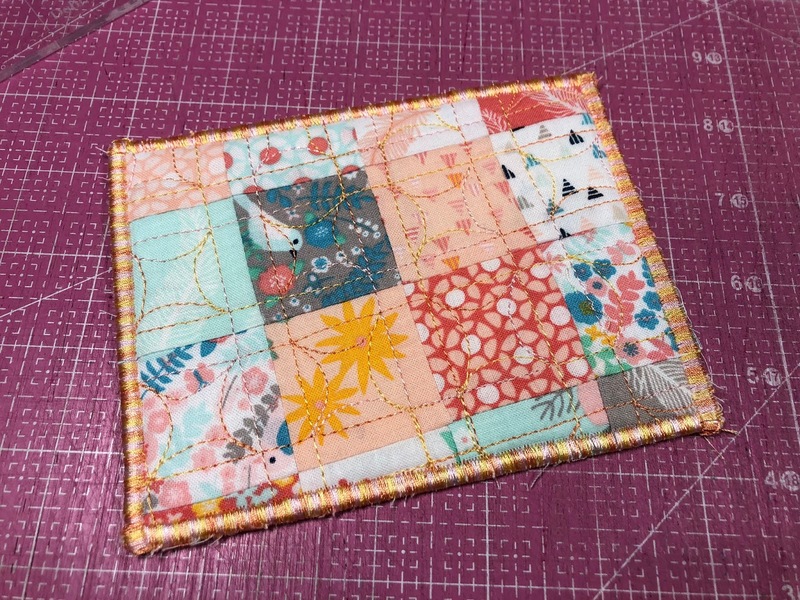 5" squares -- I'm a sucker for charm squares. 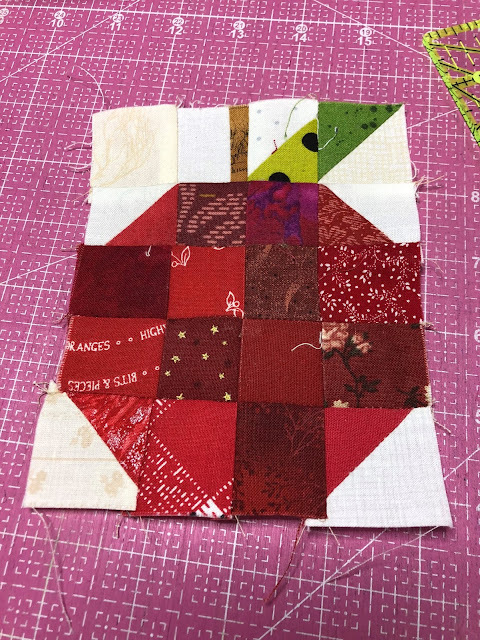 I love the Nickel Quilts books and find 5" squares incredibly useful in many projects. I have a few patterns in the works that use charm squares, so stay tuned! 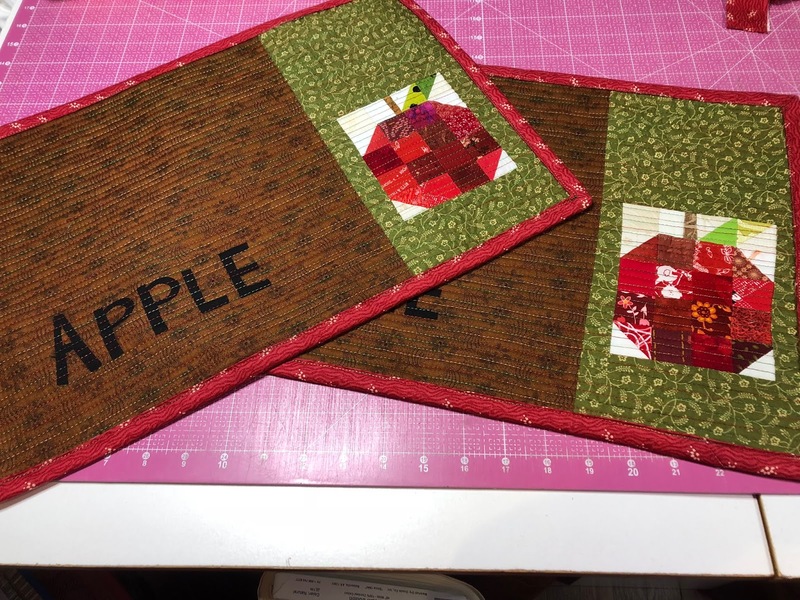 When I cut through my scraps, I cut 5" squares from the larger scrap pieces. I have a humungous bucket of squares that I hope to deal with later this year. 2 1/2" strips -- I cut a lot of 2 1/2" strips from my leftovers. 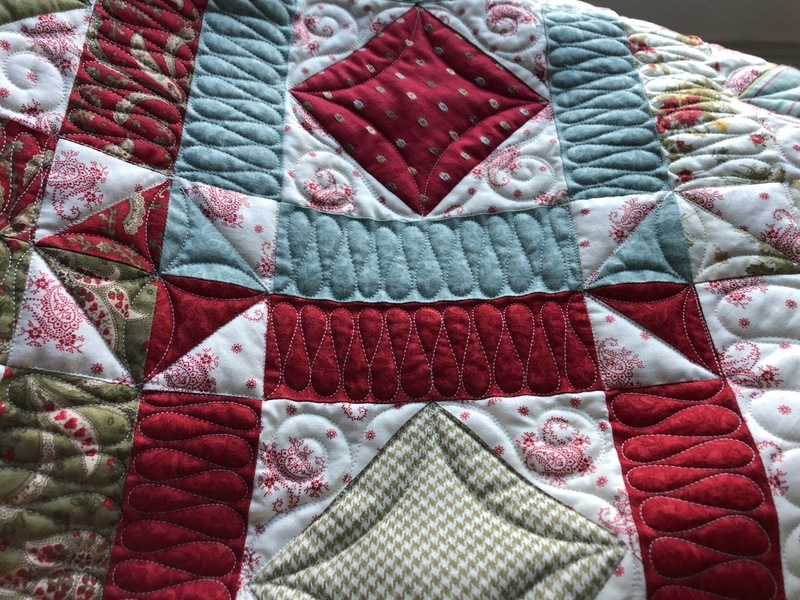 I have made so many quilts from them because of all of the Jelly Roll patterns available. I also use them in patterns whenever a 2 1/2" cut is required. I have a HUGE bucket of 2 1/2" strips that I also hope to deal with later this year. 2 1/2" squares -- I cut 2 1/2" squares and store them together. 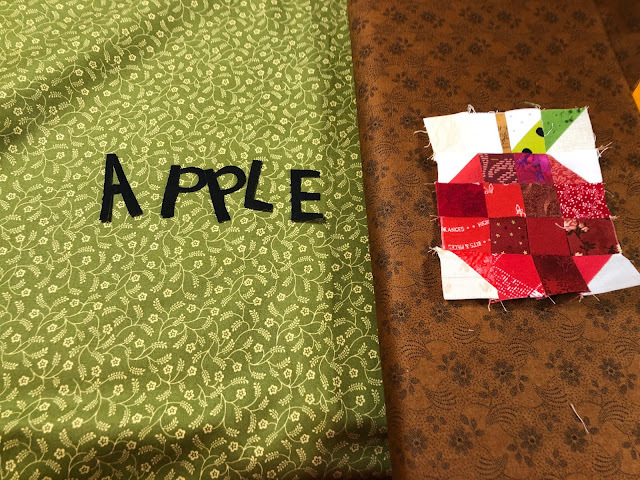 I make simple 4-patches, 9-patches, or use them in patterns requiring that size. I don't have tons of them, so I keep them inside the 2 1/2" strip bucket. 1 1/2" strips -- This is probably my favorite bucket. I have SO MANY 1 1/2" strips and each new project I finish has leftovers this size. My absolutely favorite thing to do with 1 1/2" strips is make my Sweet Tooth Cutie pattern. I have made about 5-6 of them in the last six months and have enough strips for another few already. Why is this my favorite strip size and quilt? 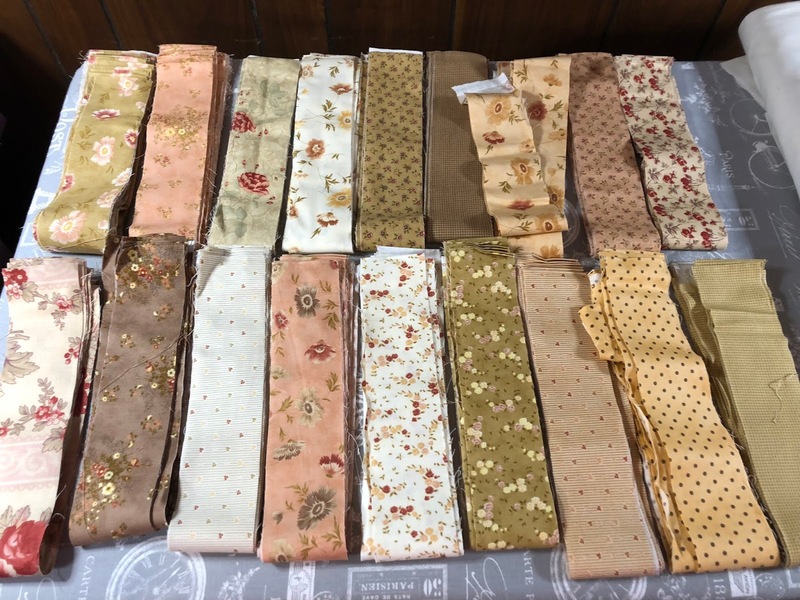 Because I get to quilt ribbon candy in all of the strips! Strings -- long pieces thinner than 1 1/2" go into a string bucket. I just started making string quilts and I'm totally addicted. 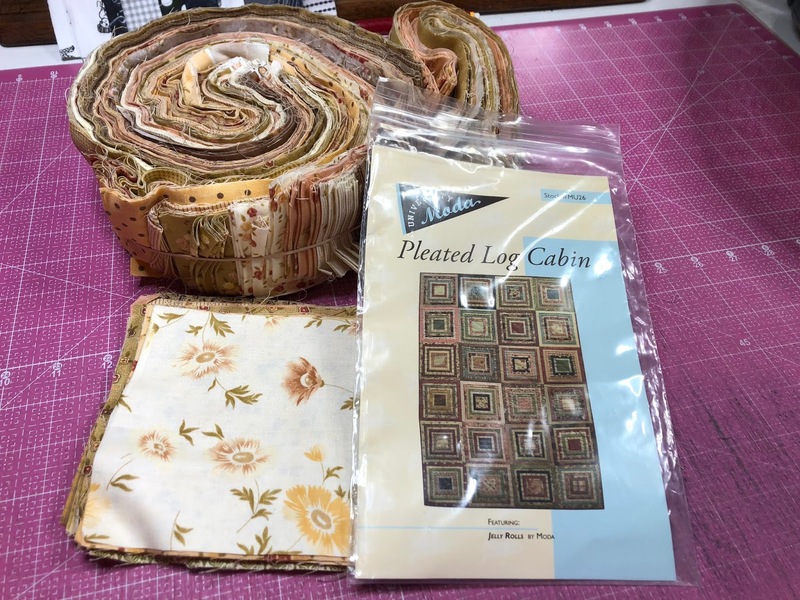 Check out Bonnie Hunter's string quilt books. She is the queen of strings! How large is it? I didn't measure it, but I quit when it was the size of a mailing envelope. 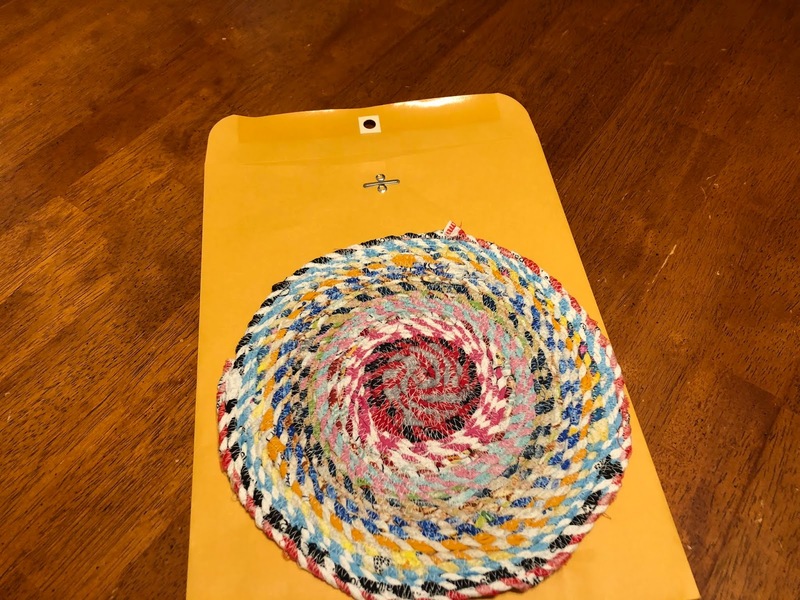 I send my mom a package every week and thought ahead enough to make this easy to mail! I plan to make more of trivets and also coasters. 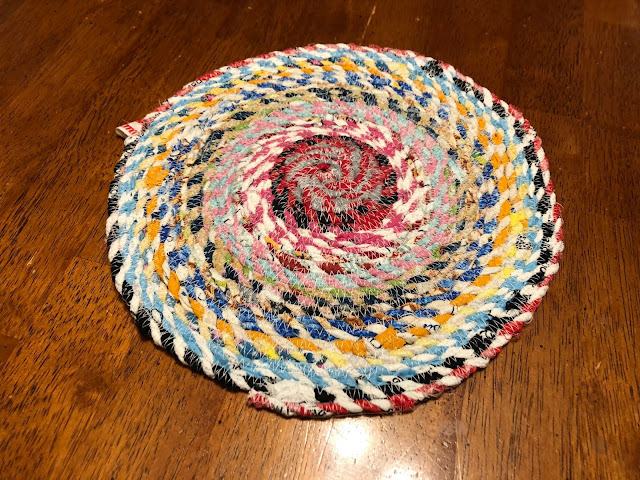 I'm not sure that I'll ever make a rug, but it would work the same way. Any piece of fabric that doesn't fit into the categories I already mentioned gets thrown into a dog bed for stuffing. I have a friend who works with animal rescue and I deliver a dog bed or three to her every few months. Hopefully they are bringing comfort to animals when they are most in need of love. 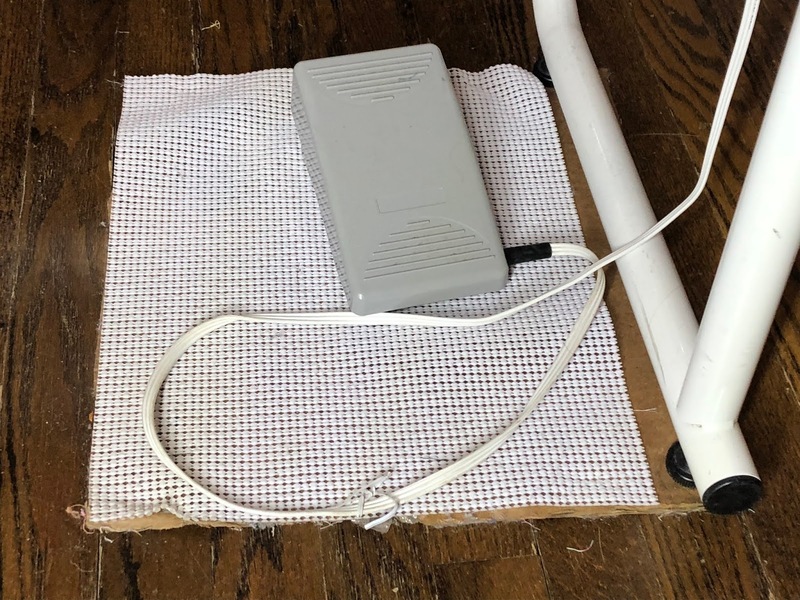 Do you have a system for scraps? Are there sizes you cut and keep that are different than what I do? Do you cut with projects in mind? Or just stash leftovers (like I have done for the last 17 years)? 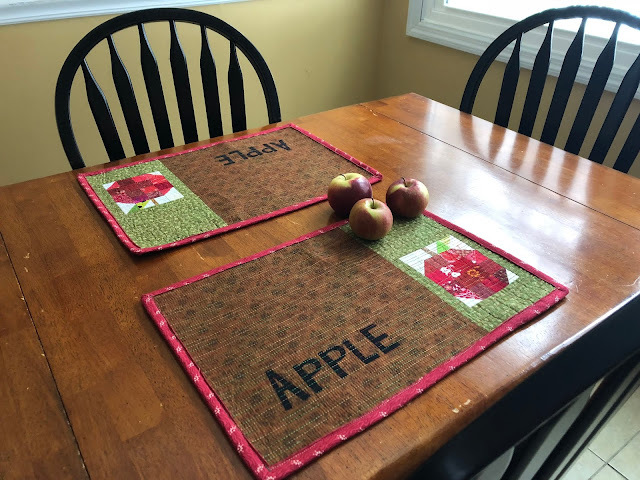 Are you a member of Annie's Creative Studio? I have a new episode there showing how to make this adorable Butterfly Garden Wall Hanging (pattern included). 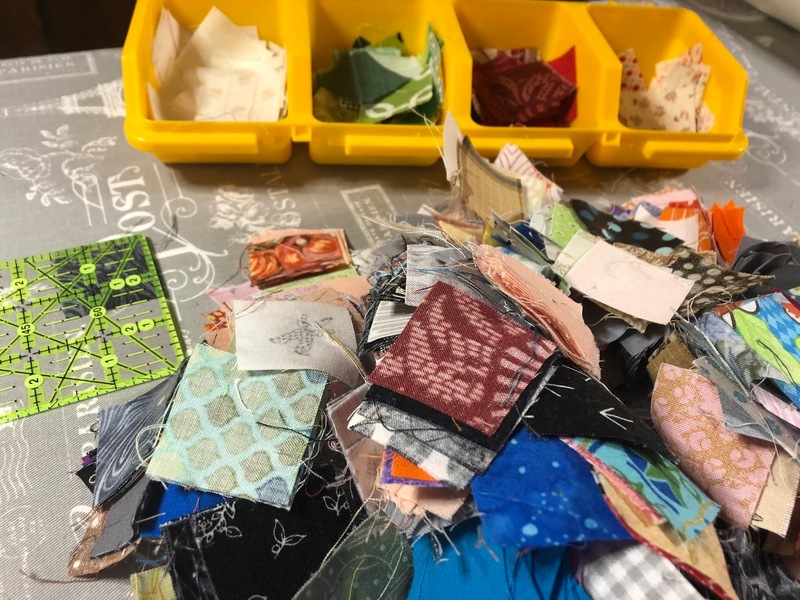 Annie's Creative Studio is a subscription-based platform so if you are a member, you can watch an unlimited number of classes about quilting, knitting, crocheting and more for free; if you aren't yet a member, you can sign up for a free trial to watch this full episode and more! 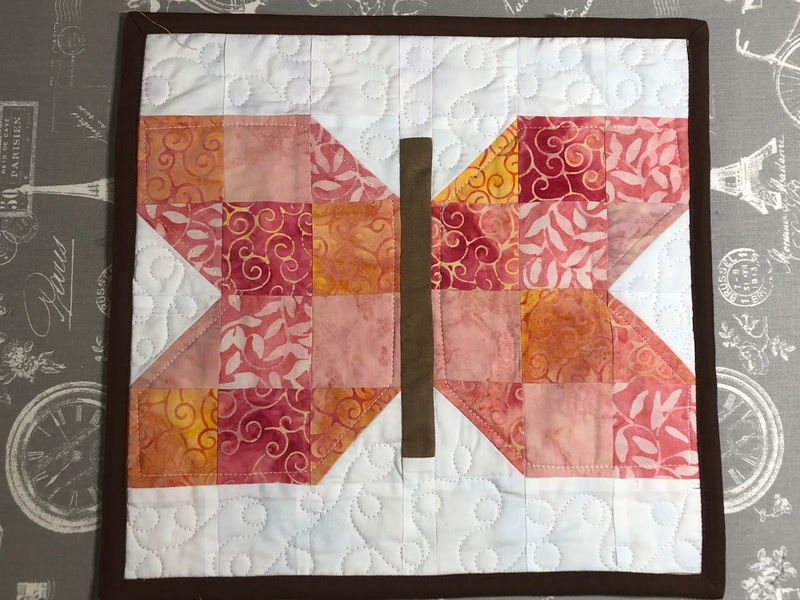 Put your scraps or leftover 21/2” strips to good use by quilting butterfly wall art! In this Learn, Make, Create! 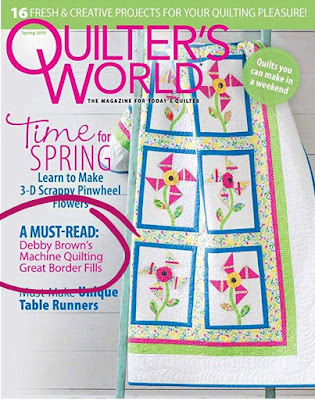 episode, quilting expert Debby Brown will demonstrate piecing tricks for triangles and rows that will amaze you. 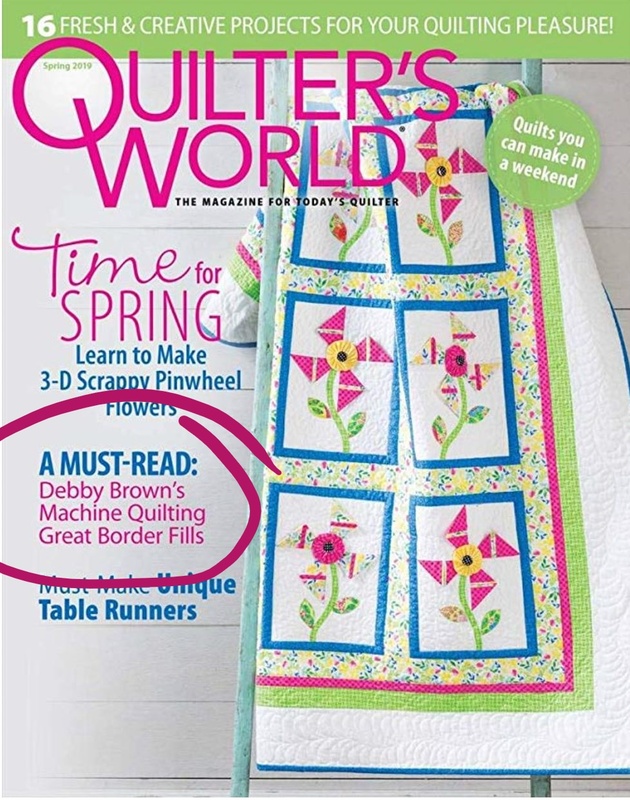 Join her for a fun, small project that will boost your confidence as a quilter. · Take the trickiness out of piecing triangles. · Piece squares together in a row. · Complete a small wall hanging to display or gift. Watch the trailer for the episode HERE. As I'm cleaning out my sewing room, I'm finding UFOs, fabric, dust, and SCRAPS! 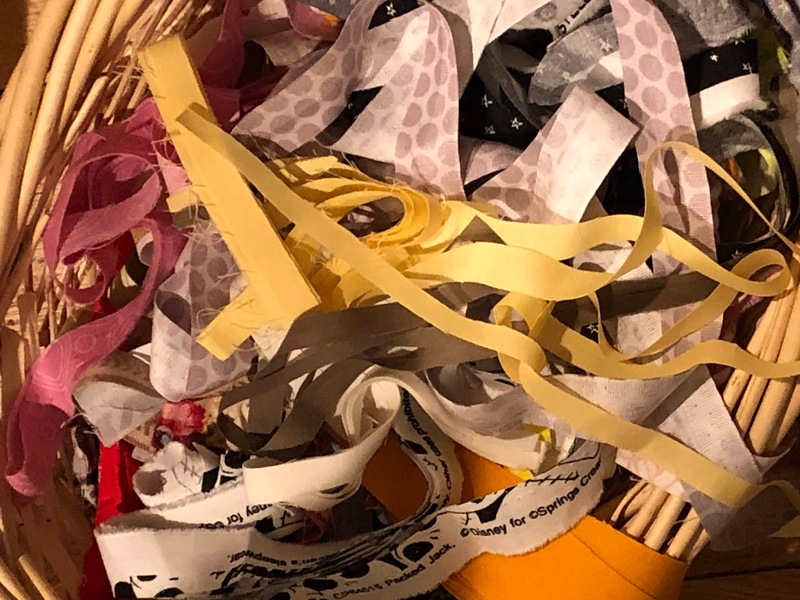 Where did all of these scraps come from? And why didn't I deal with them when I first made them? 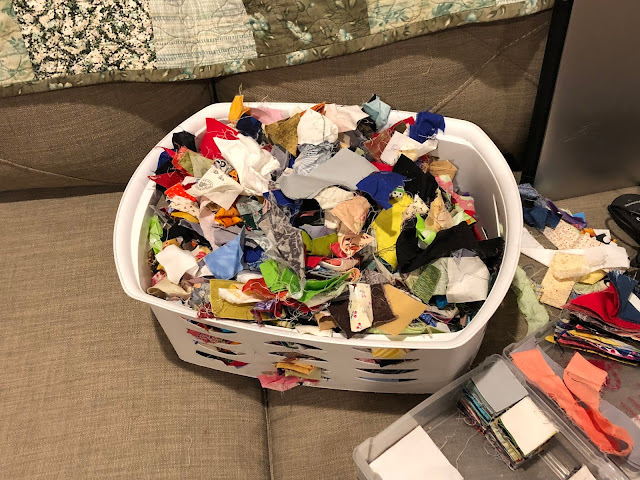 My new goal for this year is to put an end to all of the stashes of scraps I find in my sewing room. My plan is to watch movies in the evenings with my husband and cut my scraps into sizes that I can easily use in my quilts. And I haven't even found all of the scraps yet!!! I think I can cut scraps while watching three movies every night for the rest of the year and still have scraps left! 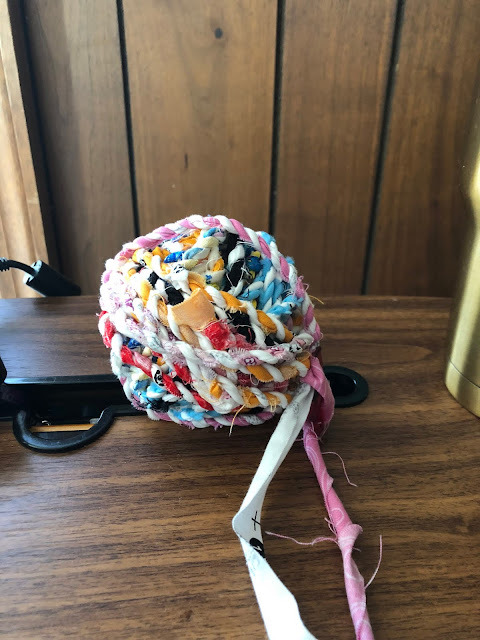 Every time I mutter about these scraps, I know that I can throw them into my dog beds and be done with them, but this "grew up in Pittsburgh with 70% unemployment" frugal gal can't bring herself to get rid of these knowing that they still have useful pieces left. Do you have a stash of scraps that needs to be dealt with? Do you dispose of them, stash them, or deal with them? Earlier this month, I finished several quilt tops at my quilt retreat. Since I'm trying to reduce the number of UFOs, I'm trying to quilt my tops shortly after they are finished. Gotta start them young, right? 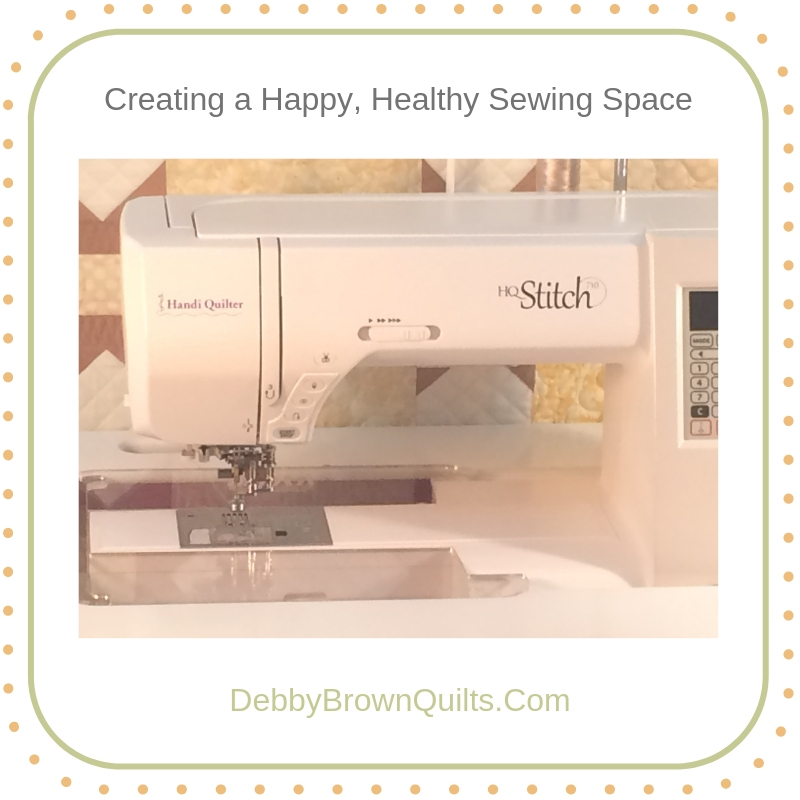 Happy, Healthy Sewing Room -- Does this Spark Joy? I've mentioned Marie Kondo on this blog before. 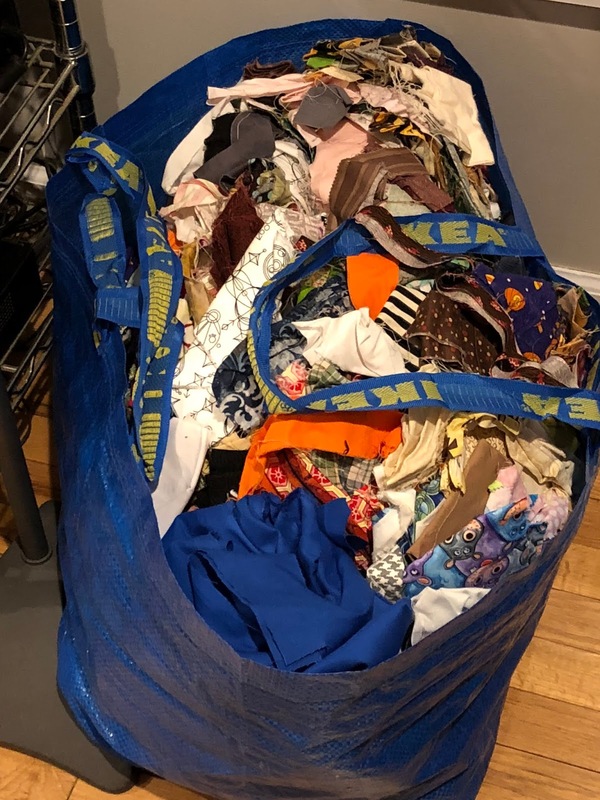 Tidying seems to be taking the world by storm right now, and also overwhelming donation sites. I don't have the energy to do a full-tilt cleanout like she suggests, but I am gradually sifting my possessions asking "Does this spark joy?" I'm finished with my clothes, books, and linens, but … the sewing room. 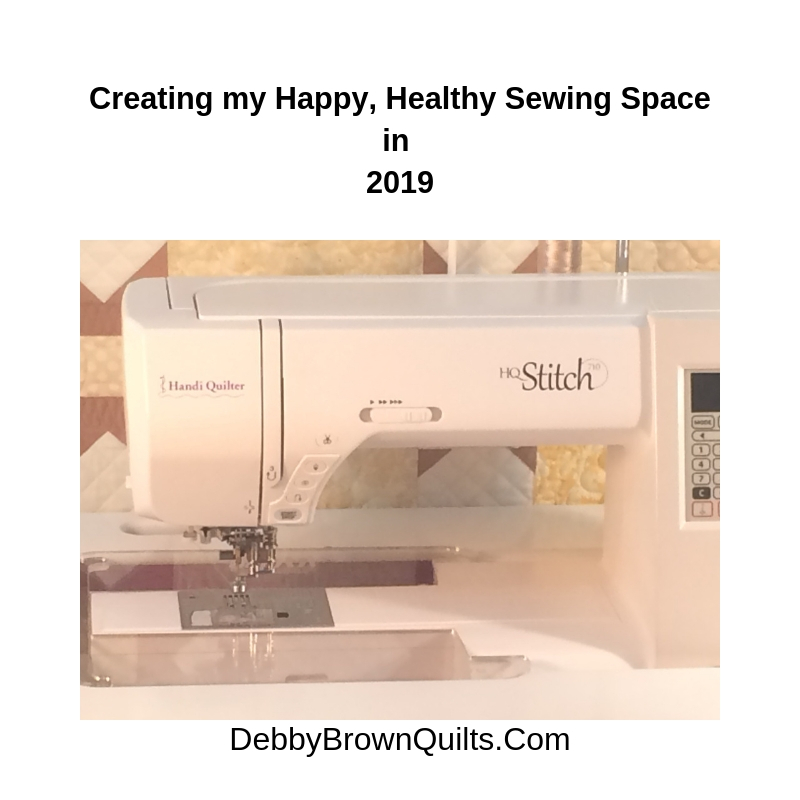 I'm trying to clean out the sewing room in 2019 to make it my Happy Place. I'm not sure what it will look like when it's finished, but I no longer want to see fabric and UFOs and kits that make me feel guilty. I want everything in here to make me deliriously happy! 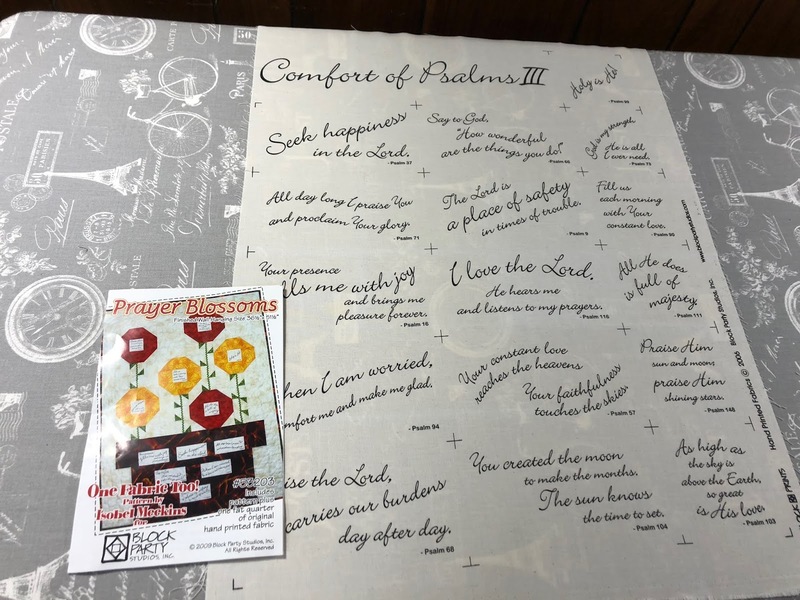 I simply adore Fig Tree fabrics. I hoard them and ration them and pet them. However, this pleated quilt doesn't spark ANY joy for me. 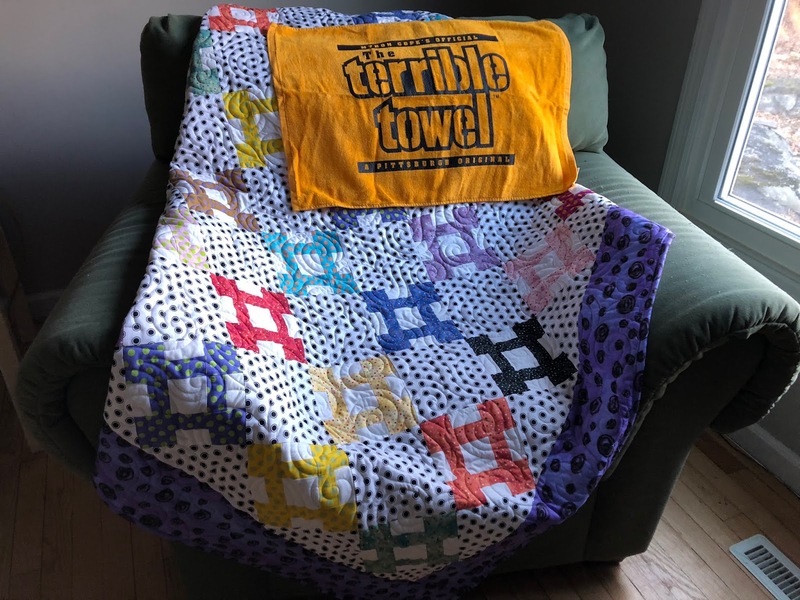 It requires no machine quilting and... 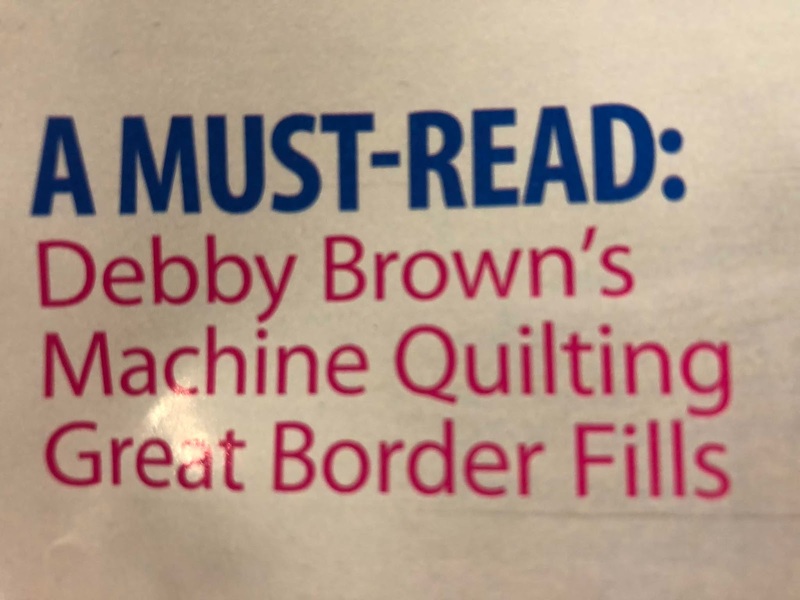 I have no words to express how this machine quilter feels about quilts which require no quilting. I'm petting and playing and deciding what to make of these gorgeous fabrics. What are your favorite jelly roll quilt patterns? 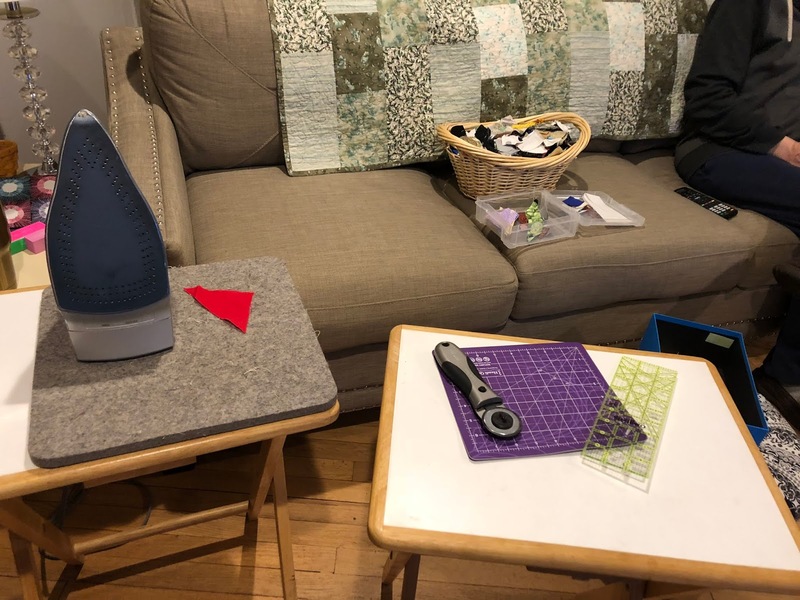 What do you do when you find a quilt kit or UFO in the sewing stash that sparks absolutely no joy? Do you feel that you have to finish it as started? Or do you find ways to re-purpose the quilt/fabric into something that you love? 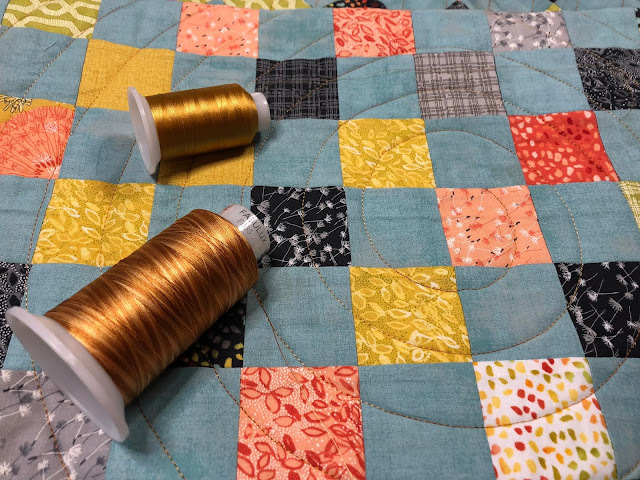 I pieced several tops at my quilt retreat earlier this month and instead of letting them languish, I'm getting them quilted as soon as possible. The fabric was oh so very yummy and naturally I added ribbon candy wherever I could. Setting triangles scream for feathers, don't you think? Congratulations to Judy and Pat! 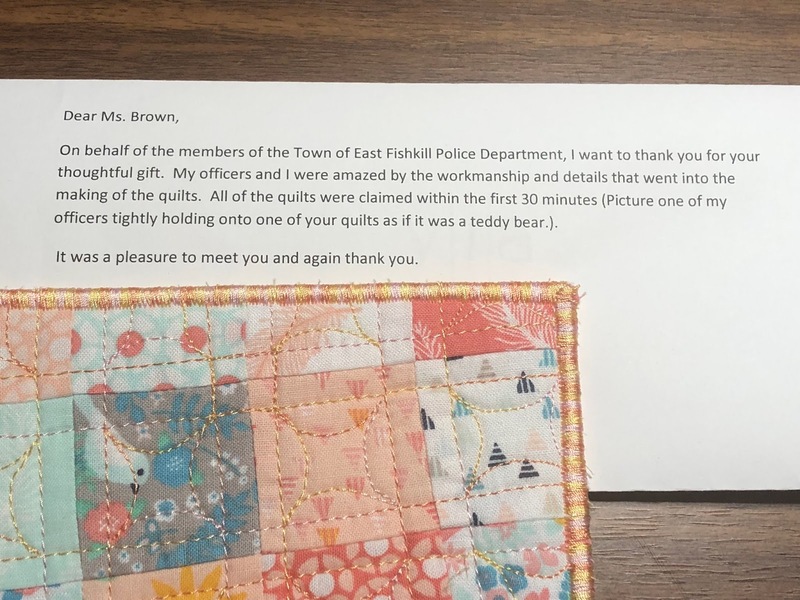 I hope you enjoy your new quilt! 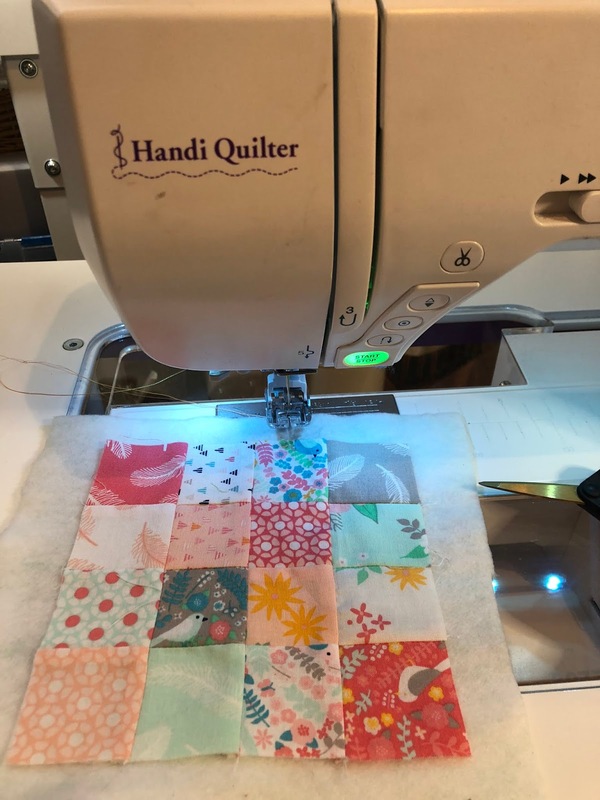 I have the fun job of going to Quilt Market and reporting back on all of the new tools and gadgets that will soon be in your local quilt shops. 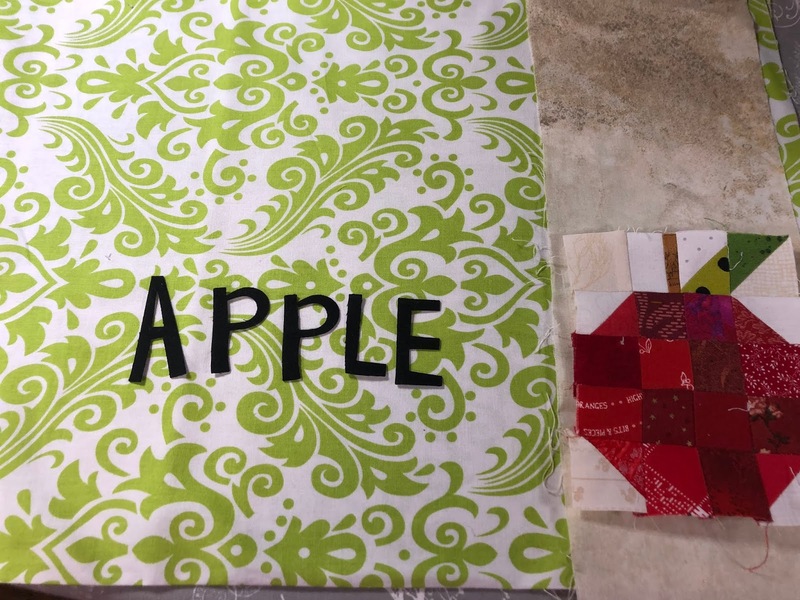 This behind-the-scenes at Quilt Market episode is featured on Annie's Creative Studio. 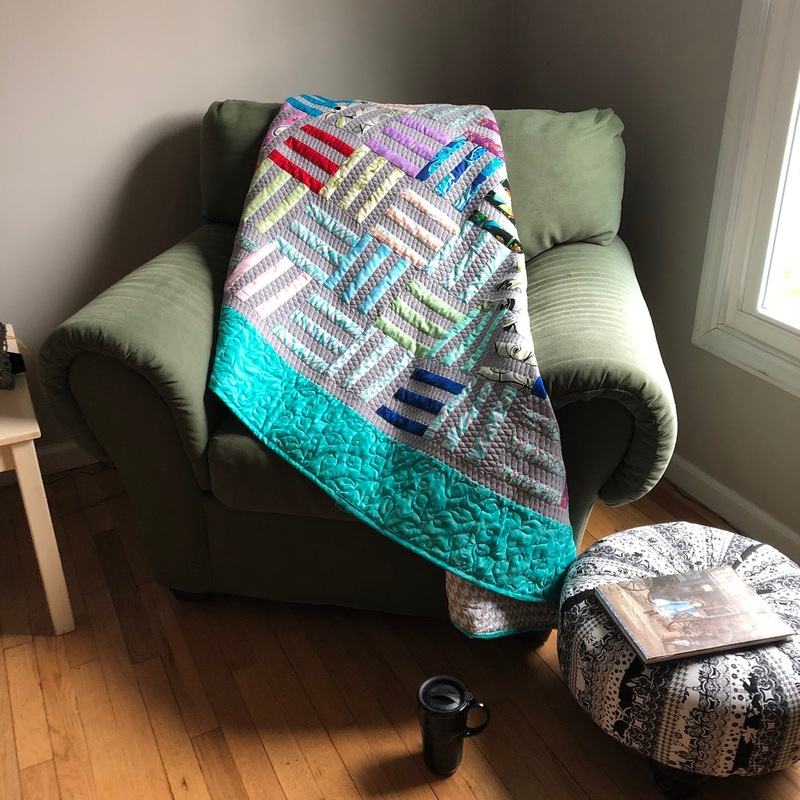 Annie's Creative Studio is a subscription-based platform where you can learn about quilting, knitting, crocheting, and more. Sign up for a free trial HERE to watch the full episode. I'm turning 50 this years but, due to a rare medical condition, my joints are much older that, including the joints in my hands. When I go to the doctor or occupational therapist and they ask "Do you do any work with your hands? 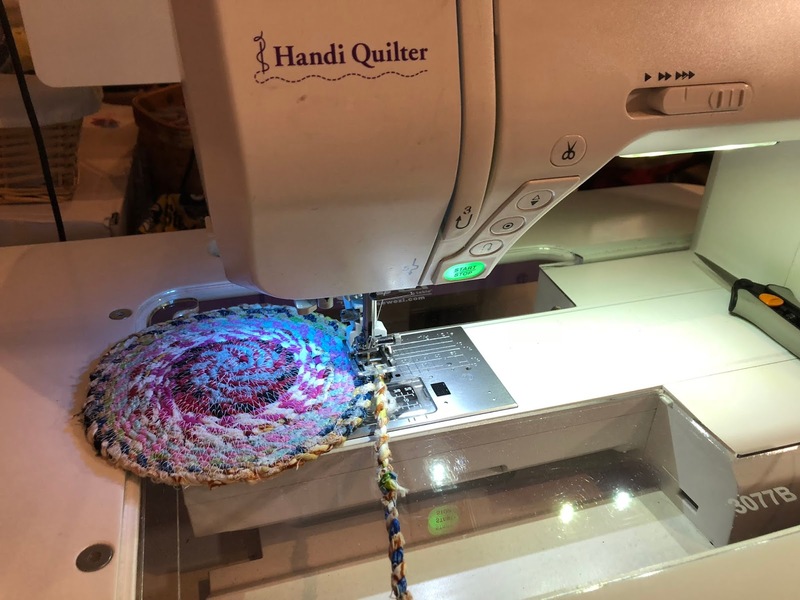 ", this quilter laughs and laughs and laughs. 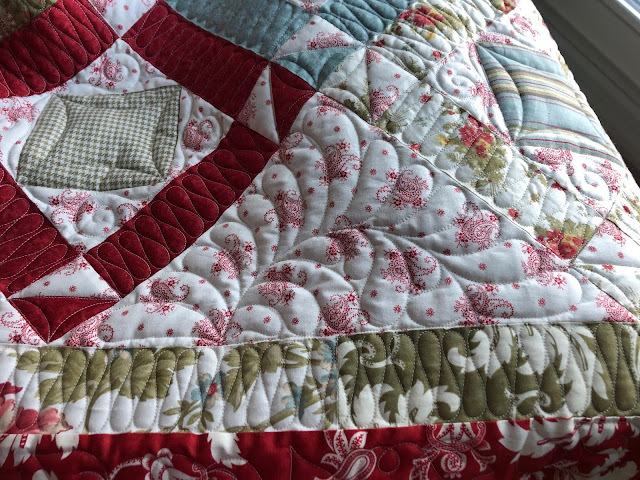 I've had to change the way that I quilt, but I haven't stopped quilting. I don't do nearly as much hand sewing and gave up the dreaded hand-binding entirely (yay me! ), but there are still other stresses on my hands. I recently upgraded my iron and am absolutely THRILLED with how much less it stresses my hands. 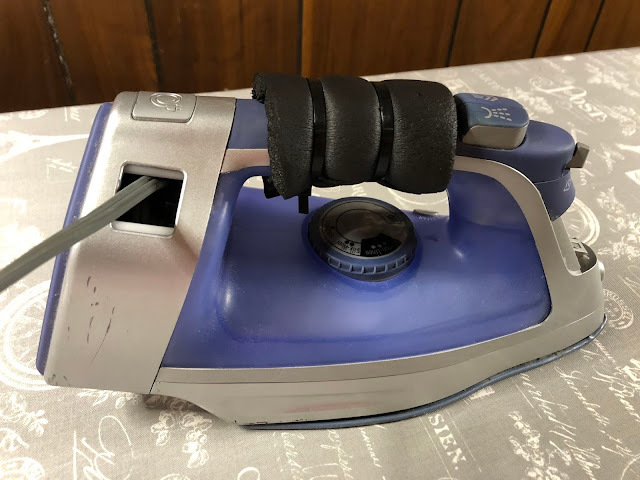 If you are about to ask "What iron did you buy?".... well, I didn't buy a new iron. I upgraded my existing iron. I wrapped the handle with foam grip. It's starting to come off, so I added a few zip ties to hold it together until I need to replace the foam. 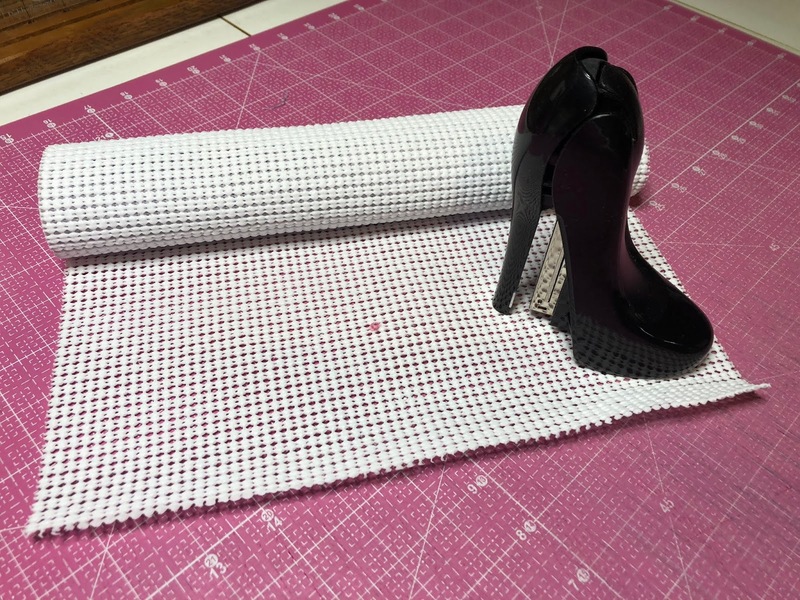 The wider grip on the handle make ironing yardage or backings so much easier! My fingers don't lock up and I don't drop the iron (much)! Sometimes, it's the little things that make the biggest difference. Did you like this week's Happy Health Sewing Room tip? Is hand stress a problem for you? I have more hand-friendly tips coming up in the future. 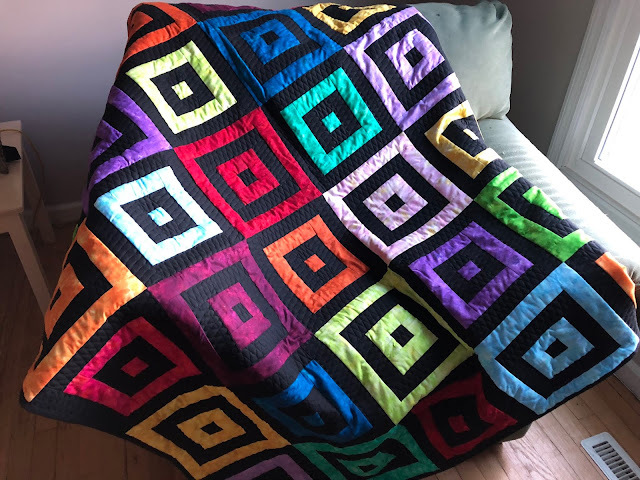 Hopefully, this is only the first of many quilts I'll finish in 2019. 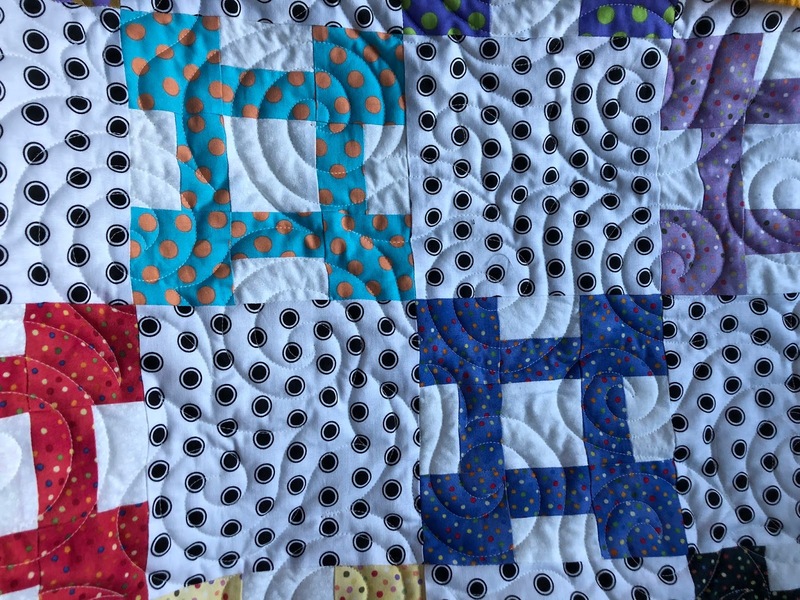 It's no secret that I love ribbon candy quilting and my Sweet Tooth Cutie Quilt pattern allows for a lot of ribbon candy! If ribbon candy isn't the easiest pattern for you, my Ribbon Candy Stencil will help guide you on this quilt. May you all have a chance to snuggle with a quilt, a book, and a cup of tea this weekend. "Inspired Free-Motion Quilting" blog hop and GIVEAWAY! 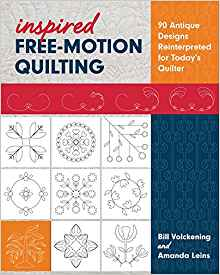 Today is my day on the blog hop to show some love for Mandy Leins and Bill Volckening's new book "Inspired Free-Motion Quilting." 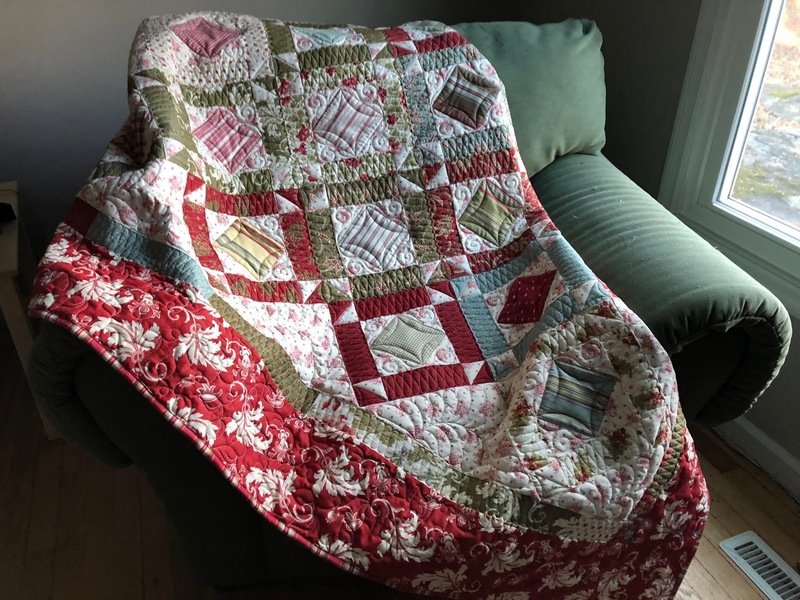 Mandy and Bill showcase quilting designs reinterpreted from antique quilts. The Double Line and Orange Peel on the far right intrigued me. 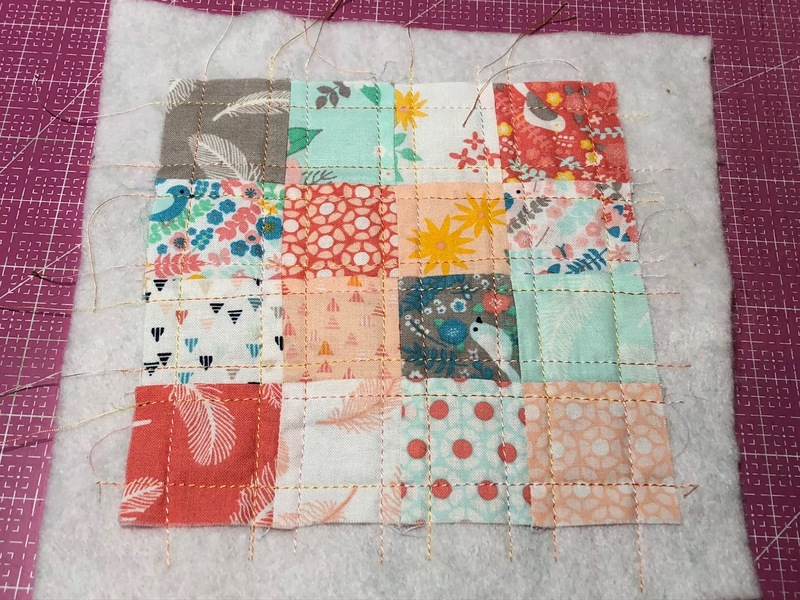 When I'm intrigued and need to experiment with a quilting pattern, I grab and orphan block and a spool of FabuLux thread and make a postcard. I put my block on a piece of batting with no backing. Using my walking foot, I stitched a straight line on each side of each seam. I switched to my free-motion foot and added the Orange Peel design. 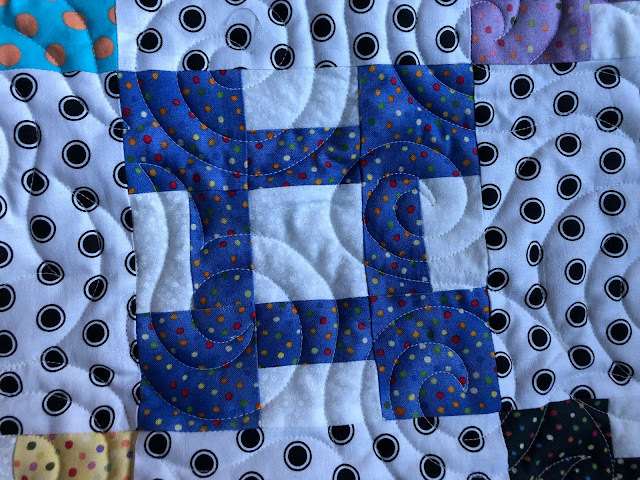 I fused the quilted block to stabilizer and a white fabric backing. 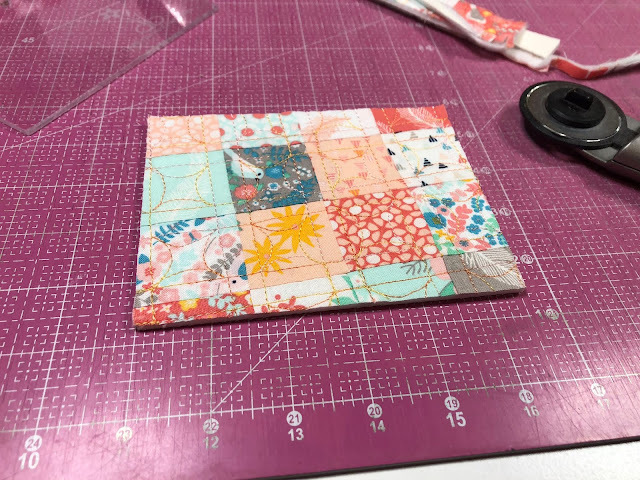 I trimmed to postcard size using my Postcard Trimming Tool. I finished the postcard by stitching around the edge. All I have to do now is mail it! Would you like me to mail this postcard to YOU? And would you like an e-copy of Mandy and Bill's book? Leave a comment here on this blog (and link or email address PLEASE!) stating a real or imaginary New Year's Goal by Sunday the 14th and I'll pick a winner. My real or imaginary New Year's Goal is to figure out where socks disappear to and where Tupperware lids appear from. It might take longer than a year to learn the answer. Visit all of the other stops on this blog hop for more chances to win!